Harrisburg, PA – Governor Tom Wolf today announced the roll out of new grant and rebate programs to improve air quality in Pennsylvania funded by the $118 million settlement with Volkswagen Group of America, Pennsylvania’s share of the settlement for allegations of cheating on U.S. Environmental Protection Agency (EPA) emissions tests. The new initiative, Driving PA Forward, is aimed at permanently reducing nitrogen oxide (NOx) emissions statewide by as much as 27,700 tons overall by accelerating the replacement of older, polluting diesel engines with cleaner technologies. Diesel emissions also include fine particulate matter (PM 2.5), which can lead to health problems such as asthma and worsen medical issues such as heart and lung disease and emphysema. Eight grant and rebate programs will be available over the next five years, with as much as $39 million available for disbursement in year one. Programs will be rolled out throughout 2018. Summer will soon be here and that can mean high levels of air pollutants in our air, specifically ozone and small particles, commonly known as smog. Meteorologists declare “Air Quality Action” days when they project that weather conditions are conducive for unhealthy air pollution. In 2016, the Pennsylvania Department of Environmental Protection (DEP) called six action days for the Susquehanna Valley. We should heed those warnings. Recent scientific studies conclude that short-term exposure to unhealthy air pollution can have significant adverse effects on pregnant women, children, the elderly, and even the general population–especially those with pre-existing conditions such as asthma. Short term symptoms resulting from breathing high levels of ozone and fine particulate are chest pain, coughing, nausea, throat irritation, and congestion. These pollutants also aggravate bronchitis, heart disease, emphysema, and asthma—and can increase risks of stroke. Children, senior citizens, and those with asthma or other respiratory problems are urged to limit outdoor activities when an action day is predicted. Air Quality Action days are often declared when there is little wind and when the amount of ozone or particles in stagnant air could exceed federal health standards. The DEP monitors local and regional air quality. Local television and radio stations alert the public when an Air Quality Action day is predicted. Check your newspaper’s websites as well. The Clean Air Board of Central Pennsylvania also monitors pollution levels and posts notices at this website when DEP declares an Air Quality Action day. Stay informed! crisis with a major public relations campaign that celebrated science and technology, while blaming cars and carmakers. 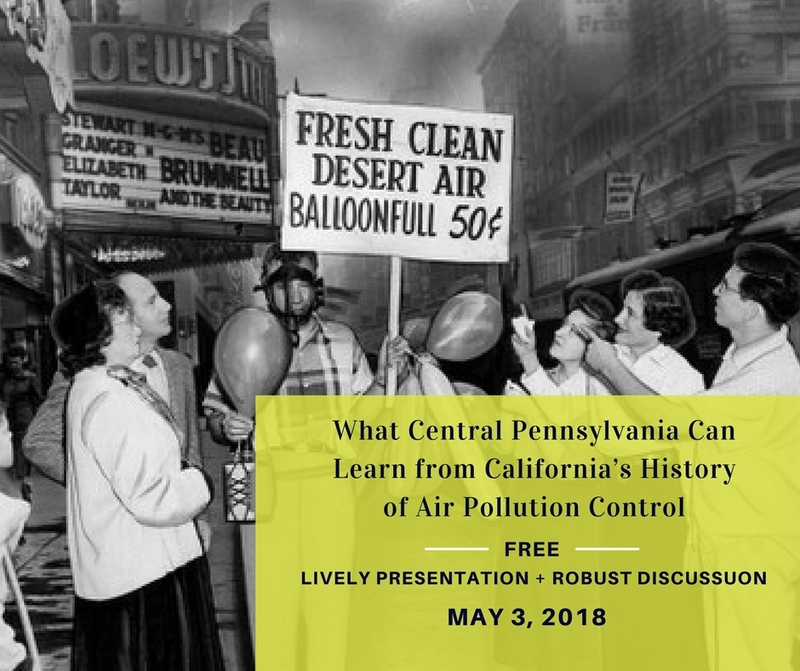 Join historian Roger Turner for a talk that uses fascinating period photos to tell this story, and then explores what lessons we can learn for fighting air pollution today. 158 West High St., Carlisle, PA 17013. Light refreshments will be served. What is in the air we breathe and are in the household products we use every day? Katarzyna Ferraro, MD, double board certified in emergency medicine and integrative medicine, treats complex medical problems in children and adults, including childhood developmental delays and autism. Craig Jurgensen, MD is a retired neurologist with 30+ years of experience working with complex neurological conditions like Alzheimer’s dementia and Parkinson’s; he has a special interest in air pollution on neurological function and health. The Clean Power Plan – Where is it now? What is going on with the 2015 EPA Clean Power Plan? The Clean Air Board will discuss the current status of the EPA’s Clean Power Plan. President Trump has announced his intention to repeal the plan. Can he do so? EPA is holding listening sessions and will keep open a public comment period until April 26, 2018. Learn more about the current status and the contentious issues. Professor Michael Vandenbergh of Vanderbilt Law School will be speaking at Widener University Commonwealth Law School on Friday, Feb. 9, at noon (bring along your lunch), in Room A180 of the Administration Building, 3737 Vartan Way, Harrisburg, Pa., about a topic that could help reduce current political partisanship on climate change. He will explain how private companies, on their own, can reduce carbon dioxide emissions by a billion tons per year over the next decade. The talk is based on a new book, Michael P. Vandenbergh & Jonathan M. Gilligan, Beyond Politics: The Private Governance Response to Climate Change (Cambridge University Press 2017). He will explain that private sector action provides one of the most promising opportunities to reduce the risks of climate change, buying time while governments move slowly or oppose climate mitigation. Starting with the insight that much of the resistance to climate mitigation is grounded in concern about the role of government, the talk will draw on law, policy, social science and climate science to demonstrate how private initiatives are already bypassing government inaction in the United States and around the globe. The talk will combine an examination of the growth of private climate initiatives over the last decade, a theory of why private actors are motivated to reduce emissions, and a review of viable next steps. This is an important talk about an important topic. The program is free and open to all the Widener community and to the public. In addition, one free CLE (substantive) credit is available. Registration is not necessary. Why Drive An Electric Car? The Clean Air Board will be meeting on Feb. 1, 7 pm to discuss the future of electric vehicles. Why drive an electric car? We will discuss this question with Felix Edem, a representative from Brenner Nissan in Mechanicsburg, PA.
Electric vehicles will become commonplace in the near future. CAB has been participating in the Drive Electric PA Coalition meetings with PennDOT, the PUC and PA DEP. https://driveelectricpa.org/ At the last meeting of the coalition, Nissan manufacturer representatives talked a bit about the 2018 Nissan Leaf, a zero emissions vehicle that can travel 150 miles on a single charge.